It’s been said that getting outside of one’s comfort zone is where all the magic happens. I’ve had my own little cocoon for years. I have a good reputation as a restorative mason. And I have I’ve been loving it … to the point of arrogance at times. 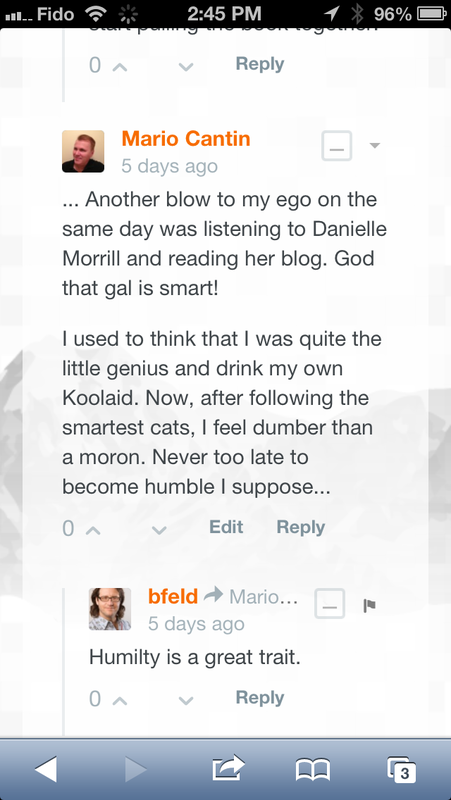 I was so drinking my own Kool-Aid. And now I’m definitely outside of my zone of comfort. I’m working on learning from and making connections with the smartest crowd in the hi-growth tech world. And to be honest, it’s making me realize just how dumb I am comparatively speaking. Just this past week I was listening to Jason Calacanis interview Danielle Morril of Watermark. She’s making a sensation in the VC world at the moment. I’ve looked at her Twitter feed and her blog and it blew my mind just how smart she is. When that happens it’s always a slap in the face. It’s as though someone has told me ‘Welcome to reality a**hole”. But it’s also a good opportunity to triangulate and reaffirm my determination to proceed while being a little more "aware of my surroundings", metaphorically speaking.